ISTANBUL, TURKEY. 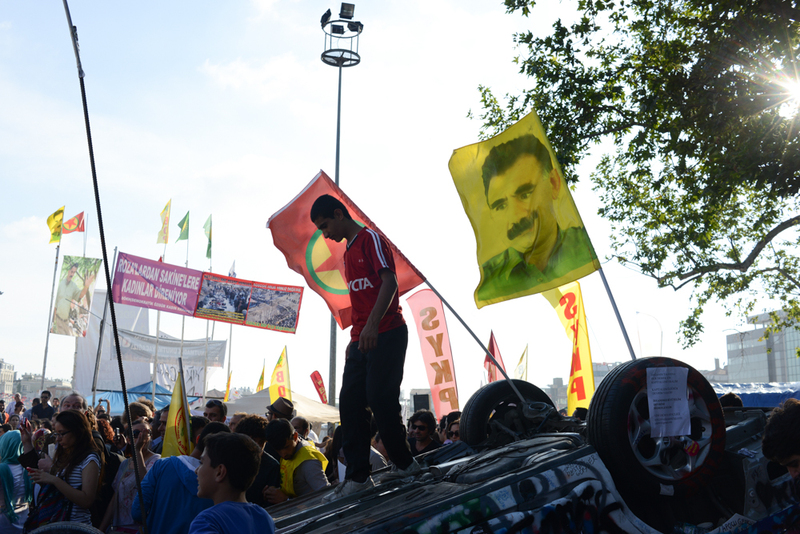 Flags bearing Abdullah Ocalan, the jailed PKK leader, and the Kurdish national flag are seen in the middle of Taksim Square on an overturned police vehicle during a protest of the Prime Minister Recep Tayyip Erdogan and his policies a week after demonstrators forced police to withdraw from the square leading to a carnival-like sit-in on June 8, 2013. A week of protests led to police being barricaded out of and withdrawing from Istanbul's Taksim Square as it transforms increasingly into a free zone; the crisis, which began over construction of a park and plans to reconstruct Ottoman barracks and a shopping mall, has evolved into Turkey's biggest political crisis in decades as Turks express frustration with the current AK Party, Justice and Development Party and Prime Minister Recep Tayyip Erdogan.